The climate and weather patterns on Hawaii can be a surprise to visitors. Next to plenty of sunshine (of course!) there can also be a lot of rain, especially during hurricane season! What is the weather like on the Big Island, and why? Typical examples of climate patterns here on the Big Island are the fact that Hawaii has a hurricane season. The islands also have a wet and a dry side, and some months are far more rainy than others. We provide a background to help you understand these weather patterns. This will help you to prepare your trip to Hawaii by showing you what to expect from Hawaiian weather. About Hawaiian weather: how does being an island influence the weather on Hawaii? The Hawaiian Islands are located in the middle of the Pacific Ocean. The closest distance between Hawaii and the US mainland is 2,285 miles, while Japan is 3,850 miles away and Australia a whopping 5,673 miles. Hawaii is the only state within the tropics and the only state to be completely surrounded by the ocean. Almost half of the land surface of the Hawaiian islands is within 5 miles from the coast! These facts have a large influence on Hawaiian climate. Because of its proximity to the equator temperatures are mild and the length of the day is pretty constant throughout the year. The dominant wind directions are winds from the east and the northeast (the trade winds, explained here). Finally, because the proximity to the ocean and the many mountains (volcanoes) on the islands, you can expect significant differences in rainfall within short distances and infrequent severe storms. The Hawaiian Islands have two main seasons: good and better! Just kidding! We call the two seasons here summer and winter and skip spring and autumn. Summer is also known as the “dry season”, and winter as the “rainy season”. The main difference between these seasons is the amount of rainfall, with more rain falling during the winter months. Summer falls between May and October. During summer, daytime maximum temperatures at sea level generally range from between 85–90 °F (29–32 °C). Hawaiian winter falls between October and April, with maximum daytime temperatures between a balmy 79–83 °F (26–28 °C). At low elevation it is very rare for the temperature to rise above 90 °F (32 °C) or to drop below 65 °F (18 °C). This stable and pleasant weather is driven by the warm ocean temperature. The surface waters around Hawaii range between 77 °F (25 °C) and 83 °F (28 °C), all year round, which makes sure the air never cools down that much. The mean annual air temperature for the Island of Hawaii. Image credit: Giambelluca, T.W., X. Shuai, M.L. Barnes, R.J. Alliss, R.J. Longman, T. Miura, Q. Chen, A.G. Frazier, R.G. Mudd, L. Cuo, and A.D. Businger. 2014. Evapotranspiration of Hawai‘i. Final report submitted to the U.S. Army Corps of Engineers—Honolulu District, and the Commission on Water Resource Management, State of Hawai‘i. The wettest months on the Big Island are between November and March, but winter rains rarely disrupt vacation plans. Weather here is very localized, which means that you can find a sunny spot nearby if it is raining at your current location. So, where are the wettest and the driest spots on the Big Island? The windward/east side of the island (Hilo) receives by far the most rain. As you can see on the map below, Hilo gets between 10 and 40 times as much rain as the driest parts of the Big Island. These dry parts are the resorts at Waikoloa, between Waimea and Kona, the summits and western slopes of the Mauna Loa and Mauna Kea volcanoes, and the most southern tip of the Big Island. The same wet/dry pattern holds up on a month-by-month basis. November and March are the wettest months, whereas during the summer months the amount of rain can decrease up to half the peak rate. Average monthly rainfall for the Big Island. This animation has been prepared using the following works: Giambelluca, T.W., X. Shuai, M.L. Barnes, R.J. Alliss, R.J. Longman, T. Miura, Q. Chen, A.G. Frazier, R.G. Mudd, L. Cuo, and A.D. Businger. 2014. 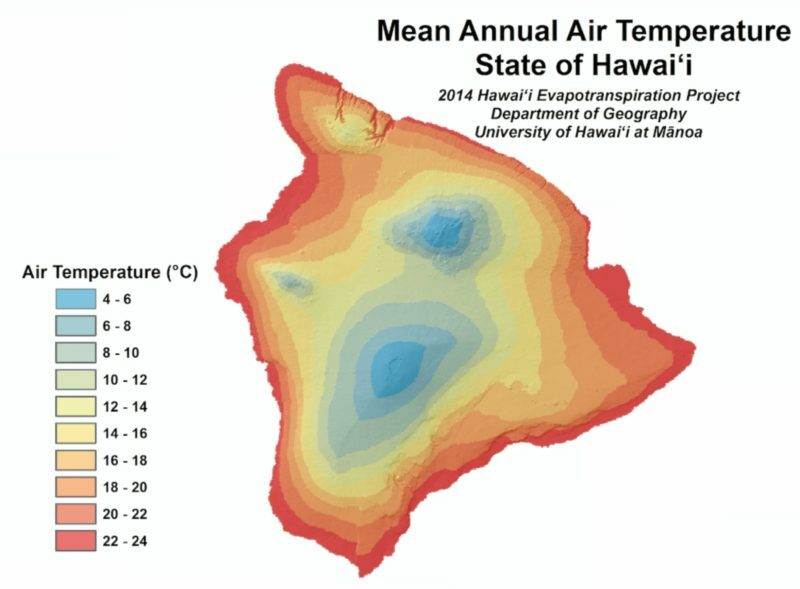 Evapotranspiration of Hawai‘i. Final report submitted to the U.S. Army Corps of Engineers—Honolulu District, and the Commission on Water Resource Management, State of Hawai‘i. 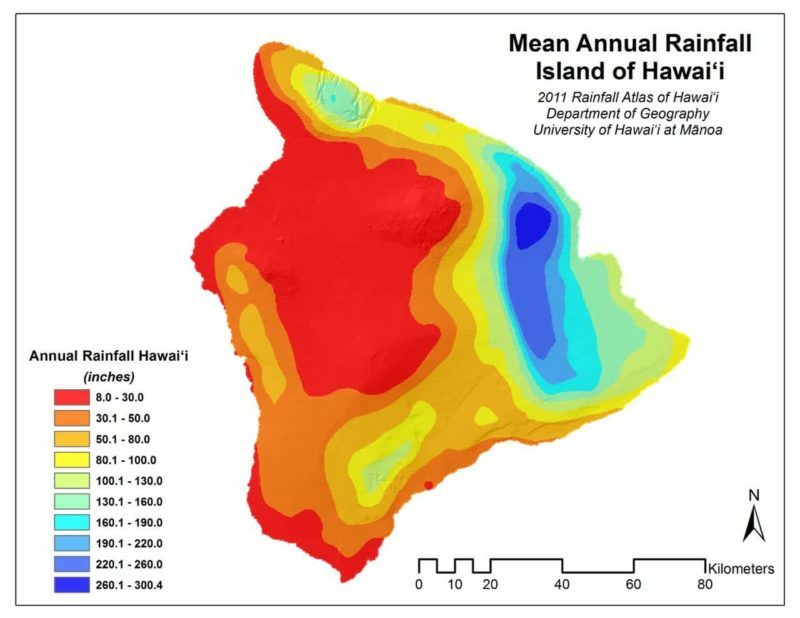 You can find more maps about the rainfall patterns in the Rainfall atlas of Hawaii. Weather patterns in Hawaii are dominated by the so-called trade winds. These are winds blowing from high-pressure zones in the north Pacific that pump cool, moist winds down onto the island’s eastern and northeastern slopes. These winds are called the trade winds because their stable and predictable patterns allowed intercontinental travel (trade) as early as in the 16th century. Trade winds over the Hawaiian islands blow from the East and Northeast between 250 and 300 days every year (source). Once the trade winds reach the mountains (volcanoes) on the Hawaiian islands, the air is lifted up. As that happens the moisture in the air condenses and produces clouds and rain. In meteorological terms, the side from which the wind comes from is the upwind or windward side. The other side of the island is called the downwind or leeward side. Thus, rain mostly falls on the elevated windward side of the islands. Coastal areas in general, and especially the south and west side or leeward sides, tend to be drier. This pattern is clearly visible in the rainfall patterns on the Big Island, as shown in the images above. It also has a large influence on the climate zones on the Big Island. You can, for example, find a humid tropical climate on the windward side, while the leeward side of the Big Island offers arid climate zones. Read more about the 8 climate zones on the Big Island. A hurricane is an extremely powerful storm. Any storm with winds of force 12 and above on the Beaufort scale (wind speeds equal to or exceeding 64 knots or 74 mph) is called a hurricane. Depending on your geographical locations hurricanes are also know as a typhoon or a cyclone. Hurricane season in Hawaii falls between June and November, with almost all activity occurring from July through September. Luckily, the Hawaiian islands themselves rarely experience significant effects from these tropical monsters that are more serious than lots of rain and large surf. This is because the volcanoes on the Big Island act as a natural buffer against hurricanes. 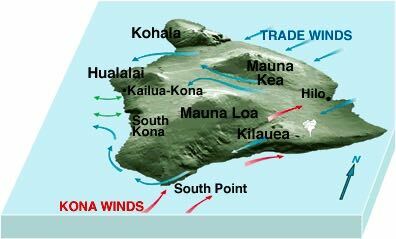 Their high peaks affect wind circulation and help break up, divert and weaken the storm as it moves toward and over the Big Island. So, what influence can a hurricane have on you, the visitor? As mentioned before, mostly bad weather and lots of rain! 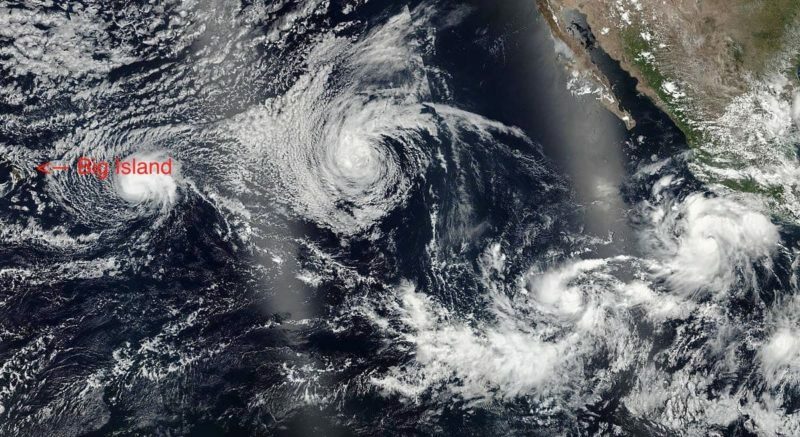 Depending on how close the hurricane is and whether or not the winds are strong enough, a tropical storm or a hurricane watch may be issued on the Big Island. When this happens, local shops and, for example, national parks, could be closed for a period of one to a few days. In the most extreme cases, flights may be delayed or rescheduled. Four simultaneous tropical cyclones heading for Hawaii on July 22, 2016. From left to right: Darby, Estelle, Eight-E (which would soon become Georgette), and Frank. If you are interested in reading more about the past hurricanes that have impacted the Hawaiian islands since the 1950’s, please have a look at the following articles: Hawaii’s Hurricane History and Hurricanes in Hawaii. Current tropical storm info (worldwide) can be found at the tropical tidbits website. Basically, any time is a good time to visit Hawaii. The best time depends on your personal preferences and circumstances, and there is no “one size fits all” answer to this question. Below we list a few considerations that may be important for you. The first part is during the summer holidays (lots of family travel) and falls roughly between mid-June and the end of August. The second part of the high season falls between mid-December and mid-March when people are visiting to escape the winter at home. On the Big Island it will never be as crowded as of example Oʻahu during high season, but prices can be higher with increased demand. Temperatures are pretty constant throughout the year and are always pleasant, but the amount of rainfall does vary. The driest months are between May and October (excluding the occasional hurricane). If you are looking to escape the winter weather in the mainland, you should definitely come visit during the cold months at home! Finally, something that people rarely consider is the length of the day. Days in June are ~2.5 hours longer than those in December. Especially if you are planning an active vacation, maximizing the amount of daylight during your visit can add many sunny hours to your trip. While pleasant temperatures are a given on the Big Island, sunny skies are not. Clouds are a very normal phenomenon on the Big Island, especially around Hilo and Puna. Most days on this side if the Island will be a mix of sunshine, clouds, and an occasional spatter of rain. Other areas with lots of cloudy weather are the central and south Kona coast, the valleys in the north including Waipi’o valley, and Pahala in the south. The sunniest skies and the best beach weather can be found on the Kohala coast. You can find the average yearly cloud cover for the Big Island on the map below. A value of 1 on this map means that there are clouds the whole year, while a value of ‘0’ means the skies are always clear. 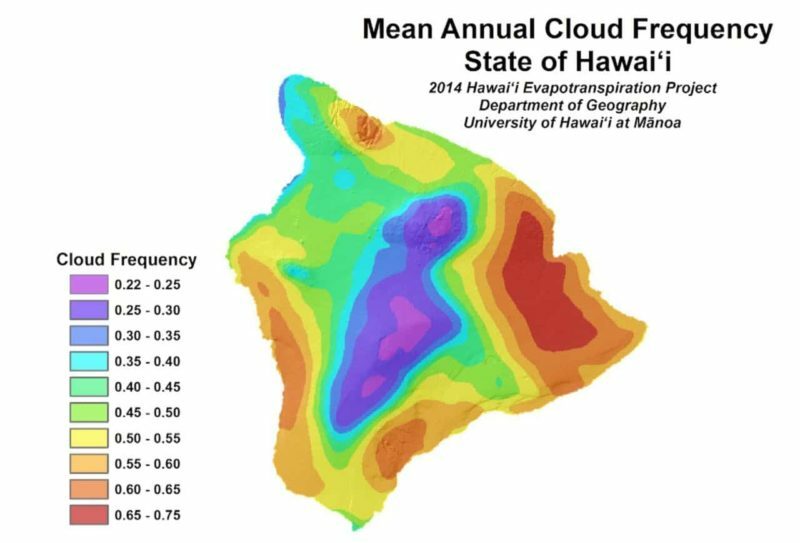 The mean annual cloud frequency for the Island of Hawaii. Image credit: Giambelluca, T.W., X. Shuai, M.L. Barnes, R.J. Alliss, R.J. Longman, T. Miura, Q. Chen, A.G. Frazier, R.G. Mudd, L. Cuo, and A.D. Businger. 2014. Evapotranspiration of Hawai‘i. Final report submitted to the U.S. Army Corps of Engineers—Honolulu District, and the Commission on Water Resource Management, State of Hawai‘i.